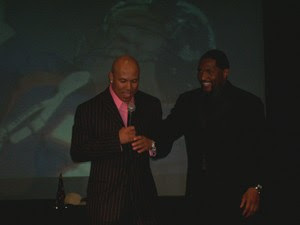 Following last night’s Super Bowl victory by the New York Giants over the New England Patriots, Ray Lewis & Hines Ward hosted a charity gala at the Phoenix Art Museum. Dubbed “MVP Main Event: Football’s Finest,” the party honored Super Bowl MVPs, past and present. Super Bowl Analysis: Which Team is More Likely to Have Someone Get Into Trouble, Giants or Patriots? Over the next week, you will be reading many important analyses of this year’s Super Bowl matchup between the New York Giants and New England Patriots. This may or may not be one of them. Go Daddy Super Bowl Ad Rejected by Fox Because it Used the Word "Beaver"
Some combinations, like peanut butter & jelly, Mike & Mike, rum & coke, and Jack & Meg White work well together. Others, like children & strip clubs, maybe not so much.